The world’s top cyclists are already putting in the preparation for this year’s Tour of Britain, in which the Borders feature heavily. Previous Tour of Britain runner-up Evan Oliphant was getting first-hand experience of the Berwickshire roads last week, describing them as “lovely and quiet, perfect for cycling”. He said that he was especially excited to race on the tour’s fourth stage, which, features those perfect roads around Duns and Greenlaw, and which also passes by his home near Edinburgh earlier in the day. Evan was speaking at the picturesque setting for the first Tour of Britain stage finish in the Borders, at Floors Castle. Stage 3 sees the riders tackle the cobblestones of Roxburgh Street in Kelso, before driving for the finishing line under the gates leading to the castle. Evan said that despite their reputation, the cobblestones may not necessarily be decisive. Evan had spent the best part of the day promoting the 2015 Tour, but after his duties were finished he was back in the saddle, and riding home to Edinburgh, continuing his training. “I’ve raced in Hawick before,” he went on “so I’m also having a look at these lovely quiet, rolling roads down here. He described how, with cycling teams’ preparations, technology had become as popular as riding the course yourself: “You can go on Google maps and things, and see the course, all the gradients and everything. That’s great because I really like knowing where all the roundabouts and things are in the last four or five miles. “In fact, on a stage coming into Blackpool one year, I was able to get the jump on other teams knowing a place where we could cut in. The arrival of the tour is already having a positive impact on grassroots cycling in the area. 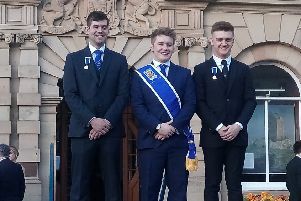 Kevin Welsh, of Kelso Wheelers, described how his young charges, in their teens, will be riding the route of the Floors Castle stage on the day of the race, ahead of the professionals. The tour makes its way through Berwickshire the day after the Floors finish, passing through Cranshaws, Duns, and crossing the Tweed at Coldstream on its way through north Northumberland to a stage finish in Blyth.